The largest airport in South Korea, Incheon International Airport (ICN), entertains passengers with unique cultural activities. Among many other interesting activities, it introduced a series of summer concerts in August, free to everyone visiting the airport. The concerts take place August 5th to 10th, at the Millennium Hall on the first floor of the passenger terminal. In the programme, visitors will enjoy performances by pianist Yang Bang-eon, the Mostly Philharmonic Orchestra, Na Yun-seon, Swedish jazz guitarist Ulf Wakenius, as well Korea’s much celebrated singer Kim Beom-su. Besides the Cool Summer Concerts, the Incheon International Airport invites passengers and fans of the genre to the World A Capella Competition, held from August 8 to 10. This is the first event of its kind organized by Incheon International Airport, and was organized in cooperation with the Korea A Cappella Society. The event will see famous a cappella teams including ‘Idea of North’ from Australia which is considered one of the best a capella groups in the world. ‘MayTree’ from Korea and ‘Freeplay Duo’ from Canada are two other interesting groups to observe during the competition. On August 8, 2014, passengers and guests of the airport can assist to a gala a capella concert. The event will be followed by a special Asian Youth A Cappella Competition on the 9th. The World A Cappella Competition will then be held on the 10th. The stage at the Millennium Hall is decorated like a ‘Gallery in Garden,’ filled with beautiful landscape and art works that already attract many airport visitors. The gallery shows works by Han Gwang-wu, and will continue to display various other artists for each season. 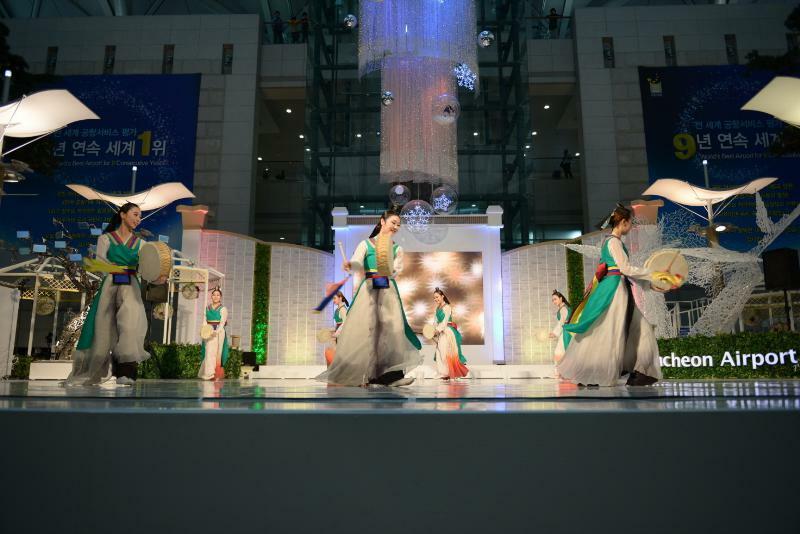 If you are interested in other cultural and entertaining events at the airport, don’t miss the re-enactment of a colorful traditional Korean wedding, reintroduced this July. The event is organized in cooperation with the Korea Cultural Heritage Foundation, and it is held at Millennium Hall.